to play in the snow. But there are oh so many more ways! Heading out into the cold when the snow is piled high to build a snowman, have a snowball fight, or make snow angels are a few traditional ways to enjoy winter. And after growing up in Upstate New York and spending nearly two years in Alaska, I thought I knew everything about how to enjoy the coldest of cold seasons. Beyond snowball fights, snowmen, and snow angels, I’ve gone ice skating, ice climbing, sledding, snowshoeing, winter hiking, cross country skiing, alpine skiing, and more. But even when we think we’ve explored every opportunity to play outside in the cold, odds are there’s at least one pursuit we haven’t tried yet, and new winter sports seem to surface every day! If you're looking for a less traditional way to enjoy the snow, give these activities a try. I missed out on dogsledding when I lived in Alaska, but did get to briefly try another cold weather mode of transportation that involves being pulled through the snow by a willing and excited furry companion. During a Winterfest celebration in Denali National Park, a few of us ventured out on a sunny -40ºF day to try out dog skijoring. And it was a blast. Skijoring can technically involve being pulled by a horse, motor vehicle, or dog, but of the options, and spending time with a happy puppy sounds like the most fun. Skijoring requires cross country skis, poles, a harness for you, and a harness for the dog. I found a rock climbing harness worked just fine for me. Most skijoring dogs are taught standard dogsledding commands for communication, and skiers typically use skate skiing to start and continue moving forward. You and the dog share the work when it comes to forward progress, assuming you do a better job of staying upright than I did. When it comes to flying through the woods on two wheels, you don't have to restrict yourself to warmer months. When snow starts to fall and temperatures drop, there’s no reason we can’t still get out on bikes, and that's where snow biking comes in. 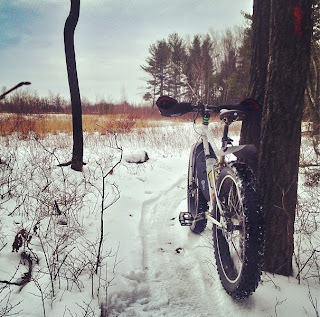 There are a few key differences between equipment used to bike in the snow and equipment used to bike on snow-free trails. Snow bike tires are wider than normal tires, and they're designed to function with lower pressure. This keeps the maximum amount of tire surface area in contact with the ground for stability and traction. Additionally, snow bike frames are designed to accommodate the larger tires. If you want to give this a try, look for groomed or packed trails, and click here for more information about the sport. Just because rivers are frozen doesn't mean you have to stop kayaking. Though I haven't tried this yet, it looks like a blast, and the risk of drowning is completely eliminated - win! Instead of relying on the flow of a body of water to move you forward, you rely on gravity. Kayaks move similarly through water and snow, which makes the transition easy. And you don't have to worry about thinks like rocks jutting out of the water, looking for eddies, or avoiding holes. Instead, just steer clear of trees, just like you would on skis. My brother's a veteran of the US Pond Hockey Championships, and whether you're a pro like he is or not, it's a fun way to take the game to a new level. After all, why play on a smooth man-made rink when you can play on a frozen lake or pond? 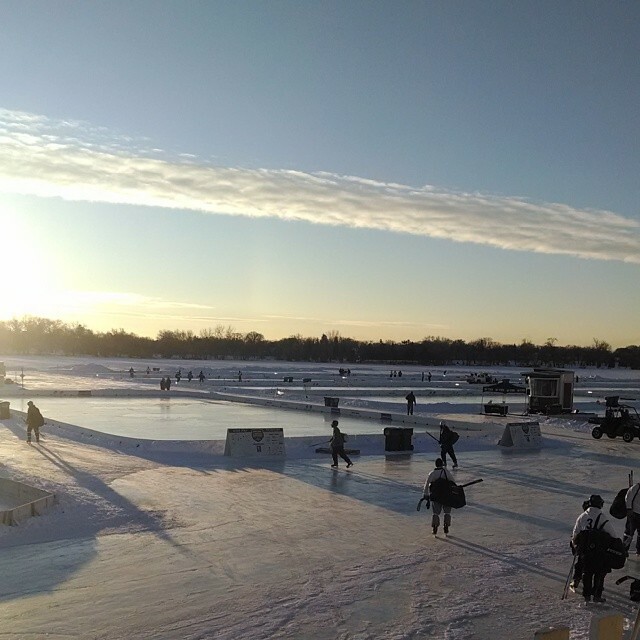 To get technical, competitive pond hockey is usually played on a smaller rink and standard protective boards are noticeably absent. The goal doesn't look like a traditional goal, and more often than not, there's no goalie. Shinny is an informal version of the sport and includes the absence of rules and positions. Regardless, putting on a pair of skates and goofing around on a frozen lake or pond sounds like the perfect way to spend a day. Just watch out for imperfections in the ice! What other non-traditional activities do you participate in to make winter fun? Do you participate in any of these? We'd love to hear stories and experiences you've had!